At RH4CM we believe that education is the key to success. And we believe that it is our duty to make sure those whom we support get a quality education. In Bombardopolis we have a now two-room school (thanks to our supporters) which serves over 150 children in six grades. In Port-au-Prince our school serves 150 children in an area of the city in need of a safe environment for learning. Through these two schools we are providing a Christian education which will empower the Haitian children to eventually contribute back to their communities. Children at both schools need supplies, books, uniforms, shoes, tuition and food. Now is the time to strengthen the community by properly providing for the needs of the children. 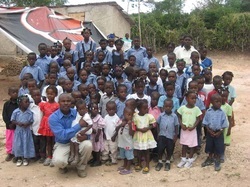 Your support of only $30 a month can help a child in Haiti learn and grow through education. 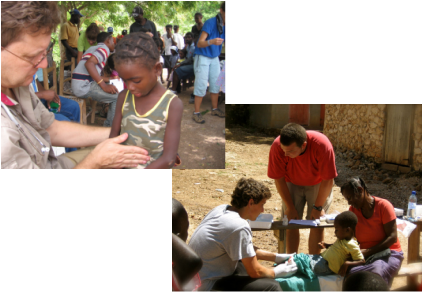 Fifty percent of Haiti 's population is deprived of basic health-care services. Diarrhea, respiratory infections, malaria, tuberculosis and HIV/AIDS are the leading causes of death. In our Bombardopolis location, a person has to walk more than 25 miles to get to the nearest hospital. Our mission includes offering medical care; life-skill training and HIV prevention education based on biblical values; and counseling for orphans, widows and families. With nurses, doctors, dentists, and public health advocates as volunteers, we can offer mobile health clinics that will provide basic services such as flue shots, immunizations, malaria screening, malnutrition evaluation and HIV/AIDS testing. Education and supplies for sanitation and safe hygiene are also of high priority. Worldwide, malnutrition kills more people than AIDS, malaria and TB combined. One out of every five children in Haiti dies from malnutrition, dehydration and diarrhea. 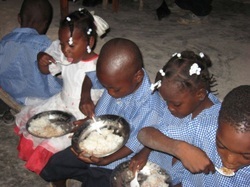 Feeding Haiti is a two part initiative that will (1) provide emergency food aid to ensure nutritious foods are supplied to help better the children's welfare and (2) improve water supply through purification and treatment. We will also be assisting residents in agricultural needs and education to insure the right foods are being cultivated. In order for this to happen, we will need many volunteersto draw attention to the current conditions. Through this focus on the basic food and water needs of the Bombardopolis community, we hope to raise not only awareness, but financial support and food donations. We ultimately dream of having a well drilled in our Bombardopolis community. 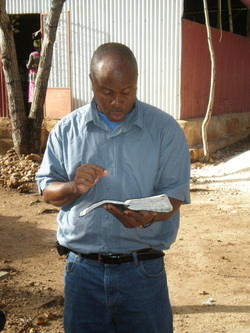 RH4CM has at the heart of its mission to spread the word of God all across Haiti to those who will listen. Through this ministry many souls have come to Christ, but many more are still without hope. We currently have two churches in Haiti; one in Port-au-Prince , and the other in Bombardopolis. If you are interested in missionary work, there is an opportunity for you to come on short term or long term missions to share the Gospel. Individuals, pastors, and evangelists are all welcome; our church's doors are wide open.